Over the years, as Faith Andrews Bedford has researched the life and work of Frank W. Benson, she has come across many puzzles. Some have been solved; many have not. One of the most mystifying is: Where have all his paintings gone? Many of Benson’s works are in museums; others are in private collections whose generous owners have graciously allowed Mrs. Andrews Bedford to feature them in her books. But there are literally hundreds of paintings out there for which she has names, sometimes even descriptions, but no images. For a few paintings, she has an image of a painting from an illustrated catalogue of an exhibition, a contemporary newspaper account of a show or a magazine article on the artist — but the painting his disappeared from view. An example of such a work is the painting “Afternoon.” Benson states that he made this etching from an oil of the same subject. But that oil is unlocated. 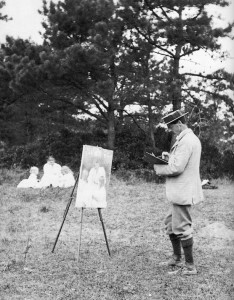 As part of Mrs. Andrews Bedford’s ongoing research she would like to find out just what the various paintings for which she has titles look like, and where they are. Where have paintings such as “Girl with a Rose” c. 1893 and “Girl Arranging Some Flowers” of 1896 gone? 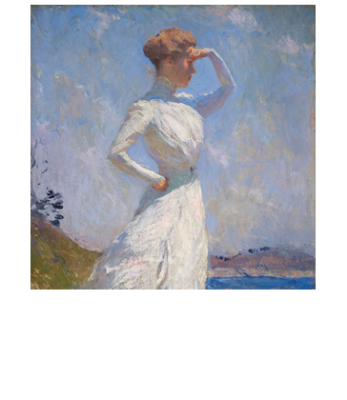 How about “Girl with a Gold Fan” or “Profile,” both of which Benson exhibited at the Twenty-fifth Anniversary Exhibition of the School of the Museum of Fine Arts in Boston? Where are paintings with sunny titles like “Afternoon Sunlight” (c. 1904),” “Sun and Shadow” (c. 1911), or “Boats in Sunlight” (c. 1907)? Benson painting “Mother and Children”, a lost work. This photograph of Benson’s family posing for a painting entitled “Mother and Children” exists, but the painting is unlocated. And what of Benson’s later sporting works? He painted over 500 watercolors but only a few have been seen by the public. Where are his handsome oils of hunting and fishing scenes, works like “The Northwest Wind” or “The Fox Hunter?” Where are all the striking black and white wash drawings he did in the mid-thirties? If you think you might have such a “lost” painting or might know where one is, please contact us at info (at) frankwbenson.com. All information will be kept in the strictest of confidence.